TheTownCrier: ROTTEN, miserable NRSC, NRCC still using Trump to raise $$ for their own! ROTTEN, miserable NRSC, NRCC still using Trump to raise $$ for their own! ONE day! It took only one day after Trump wins...IN SPITE OF THEM...for the Republicans in the House (NRCC) and the Senate (NRSC) to scam Trump supporters into supporting their RINO candidates...NONE of which helped Trump! TTC has written about this extensively...BOTH have been doing this since Trump announced and have STOLEN likely millions of $$$ from the Trump campaign and they have NO intention of stopping...unless YOU make them! These elected traitors give NOT one rip about you or the United States of America. They care about their own little club and ripping you off to enrich themselves. This morning's emails brought them out from under their DC rocks asking WHO you want for VP....first....WHO gives a damn! Mr. Trump will pick his VP, not this rotten RNC! Donald Trump is the only remaining candidate in the Republican presidential race and has now become the presumptive nominee. Now he needs to select a running mate! Who do you want to be Donald Trump’s vice president? Cast your vote for the Vice Presidential candidate you would like to see Donald Trump select. Sounds innocent? NO....YOU will be on their list and they will sell you something pretending to support Trump. And worse, they will use this to pick the VP, trying to undermine Trump! THAT'S right!!! It's all about financing the Rubio's, Grahams, Cruz's..........NOT TRUMP! These SOB's know full well that Mr. Trump has demanded ALL entities besides his campaign STOP selling Trump GEAR! Get it through your heads...the RNC, NRSC, NRCC care NOTHING about any of us! They will still try to destroy Trump. He is going to ERASE the K Street control of our government and they will do ANYTHING to stop him! 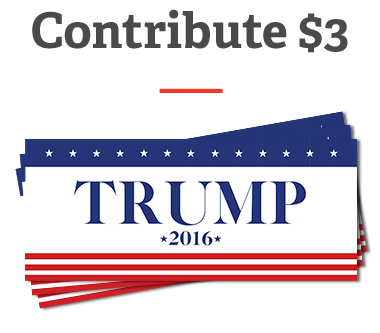 Show your support for Donald Trump and our Republican Senate majority with your NEW “Trump 2016” sticker today! By law, the maximum amount an individual may contribute is $33,400 per year. AND way down at the bottom, where no one will notice: Paid for by NRSC. fundraising databases on the back of Trump and his supporters! Here are the traitors who run the NRSC now. Cruz was in the group until he ran for pres. You don’t get in this little club unless you are ONE OF THEM. Roger F. Wicker, Chairman, represents Mississippi in the U.S. Senate. Wicker was elected by Senate Republicans to serve as the Chairman of the NRSC during the 2016 election cycle. VICE CHAIRS...ALL who have SOLD out!